Aso Volcano is rich in diverse and awe-inspiring topography and geology, including one of the world's largest calderas and many smaller volcanos. People have made their homes in this natural environment for tens of thousands of years, developing a unique culture and landscape. 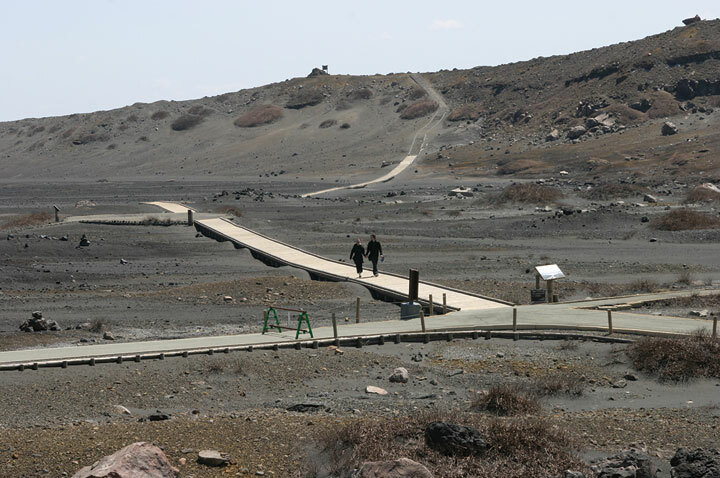 Aso Geopark encompasses a large area including the caldera and its surroundings, with many geosites throughout highlighting the volcanic topography and geology. The landscape is full of elements that we ordinarily see and touch without much thought. In fact, these geographical features are the keys to unraveling the formation of Aso Volcano and the history of human interaction with it. Aso Volcano's huge caldera and large volcano group were formed by repeated volcanic activity beginning over 270,000 years ago. For tens of thousands of years, human communities have also been shaping the land, primarily in their management of the vast grasslands. Conversely, their culture has been deeply influenced by the natural environmen. The geopark highlights the diverse topography and geology of the caldera and its surroundings through several dozen geosites. The region’s natural and human geography informs the mission of the park: to deepen understanding of the volcano’s formation and of the relationship between nature and culture in the surrounding areas. In order to reflect this overarching theme in the park’s activities, three more detailed subthemes have been developed. Aso's world-class caldera was formed over several hundred thousand years of volcanic activity. By deepening their understanding of the ways in which earlier stages of activity shaped the land and of how the massive eruption that formed the volcano approximately 90,000 years ago impacted the region, visitors gain a sense of the earth's power that goes beyond what science along can convey. Located at the approximate center of the caldera's central cone group, Mt. 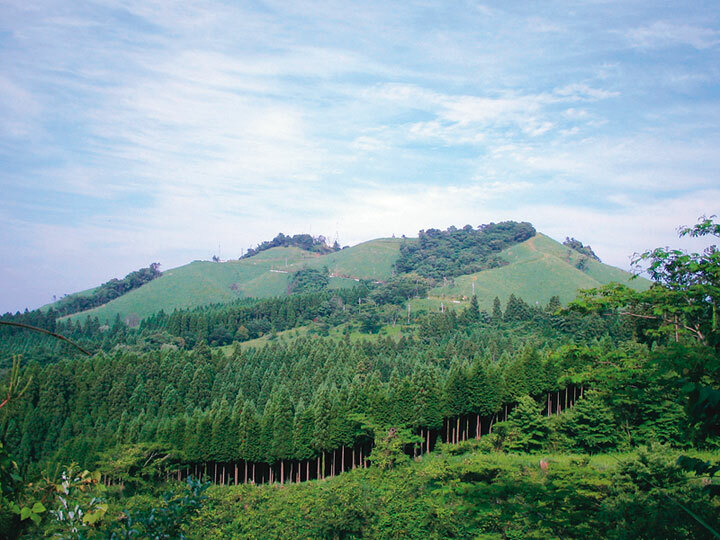 Nakadake has been extremely active since the dawn of recorded history and today is one of Japan's few active volcanos. Nakadake's unique features include the crater lake (or "yudamari") inside the mouth of the volcano, the unusual volcanic landscape surrounding the crater, and the volcano's relationship to daily life in the area. Hundreds of thousands of years of volcanic activity have brought many gifts to residents of the Aso region, from the springs that area a common feature of volcanic regions to the many hot springs in and around the caldera. 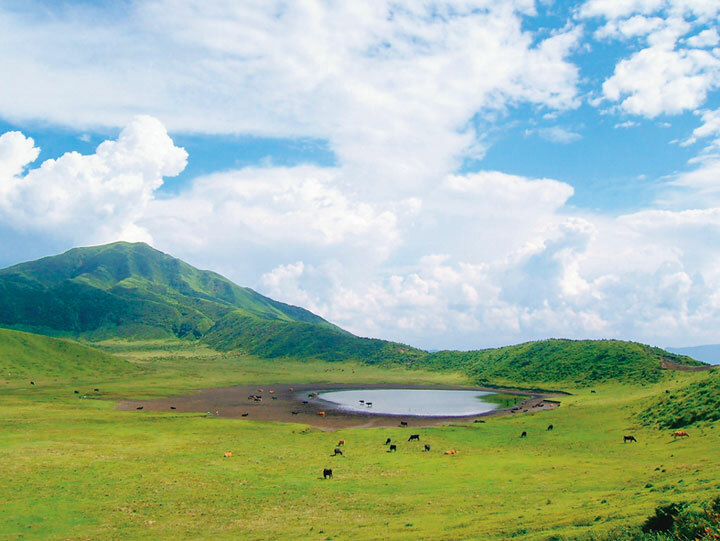 The vast grasslands found throughout Aso are a historical product of over a thousand years of grazing, grass harvesting, and burning. Local people have developed a symbiotic relationship with the volcanic environment, founded on reverence for nature. The result is a unique local culture. Aso Volcano came into existence approximately 270,000 years ago, and since then has gone through repeated periods of volcanic activity. The present caldera, with its clearly visible caved-in topography, was shaped approximately 90,000 years ago by a huge eruption. 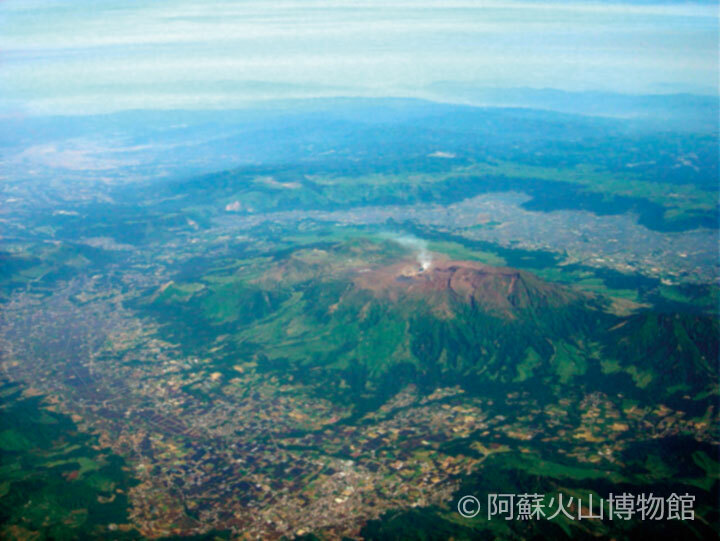 Pyroclastic flow deposits from that eruption have been discovered in Yamaguchi Prefecture as well as across the Ariake Sea in Shimabara and Amakusa. Today more than 70,000 people live inside this enormous caldera. Their unique culture has developed over many generations of coexistence with the volcano. The volcanic group inside the caldera is composed of many individual mountains with a wide range of volcanic shapes and formation periods. As a whole the group is extremely diverse in terms of topographical characteristics, composition, and internal structure. It includes many important geosites where visitors can deepen their understanding of how volcanos are formed. Of these, the Nakadake Crater region has a particularly diverse array of eruptive products, volcanic topography, unique plant life, and extremely rare aeolian landforms (features produced by wind, such as sand dunes). It is an excellent site for gaining a comprehensive understanding of volcanic activity, eruptive products, landforms, and vegetation. As one of the few places in Japan where visitors can view an active volcano up close, Nakadake Crater is the epicenter of sightseeing in Aso. Over the past 1,000 years, volcanic ash eruptions have been the primary form of activity at the volcano, with magmatophreatic explosions and Strombolian eruptions during active periods, and fumarolic activity and processes related to the formation of the crater lake occurring during quiet periods. 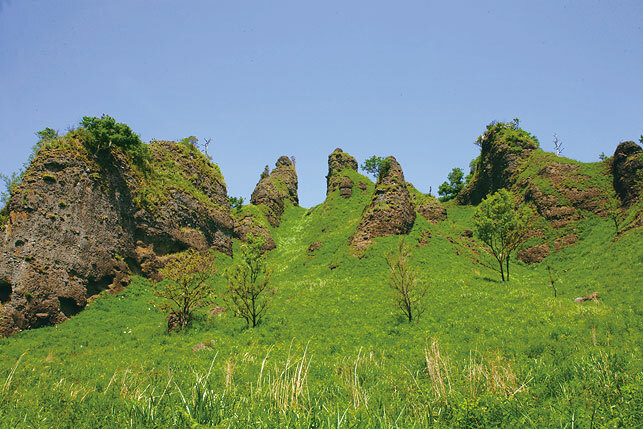 A typical scoria cone formed about 2,000 years ago, Komezuka is among the most symmetrical cones of its type in Japan. 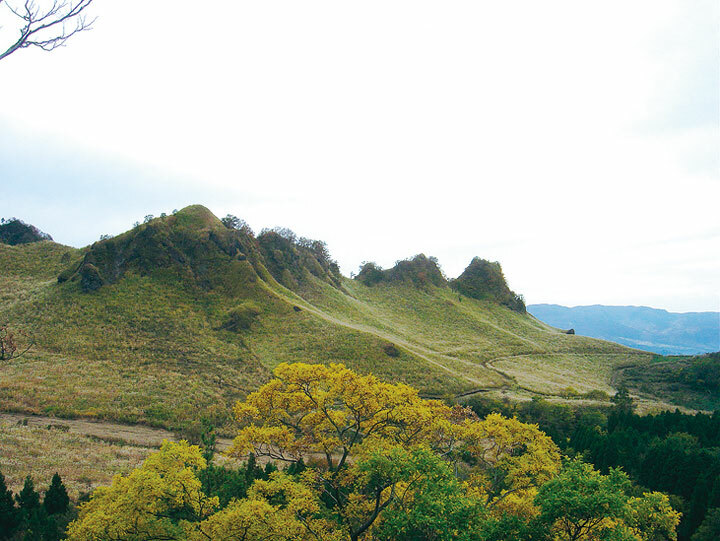 Formed several thousand years ago, Sunasenri-ga-hama is the crater basin of one of Nakadake's younger volcanic edifices. The area is covered in black sand and fine powder from the scoria cone. Visitors will also notice alluvial deposits originating in the dissection of pyroclastic cones, including volcanic projectiles and abundant volcanic cinder. A few plants such as Japanese knotweed also survive in the basin. Inside the 1km-diameter crater formed approximately 30,000 years ago is a second crater measuring about 400 meters across. The pond that is visible today on the west side is the floor of the outer crater, while the pond on the east side is the inner crater. The inner crater was formed when a dacitic lava dome was blown off. The remains of that dome are called Komatateyama. Plains extend to the north and south of the volcanic group inside the caldera, called Asodani Valley and Nangodani Valley respectively. 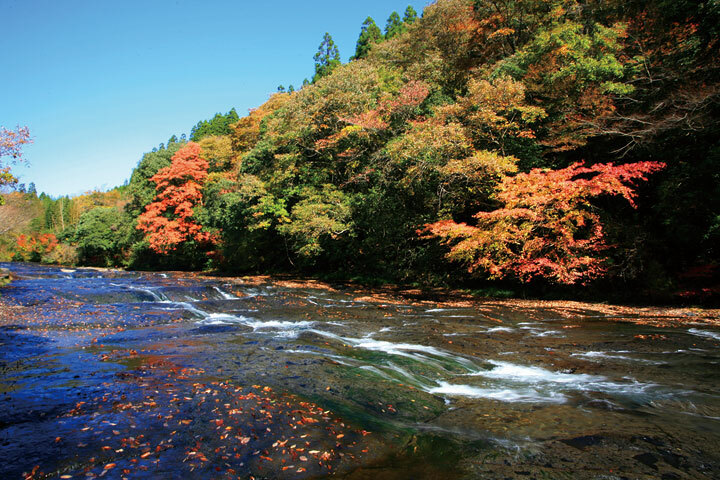 Many villages sit within the alluvial plains of Asodani's Kurokawa river basin and Nangodani's Shirakawa river basin. Paddies and fields are also found throughout the plains. Many of the geosites in this area are related to water. In addition to numerous hot and cold springs (including artesian wells) and waterfalls on the Shirakawa and Kurokawa rivers, peat bogs and yellow ochre soil reveal past environmental changes while lacustrine sediments evidence the past existence of a lake inside the caldera. 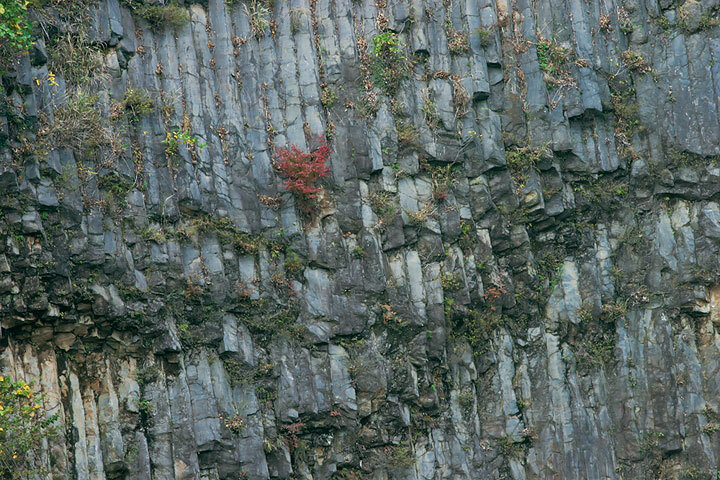 These columnar joints developed in the Tateno lava near Tateno Gorge at the western end of the caldera. 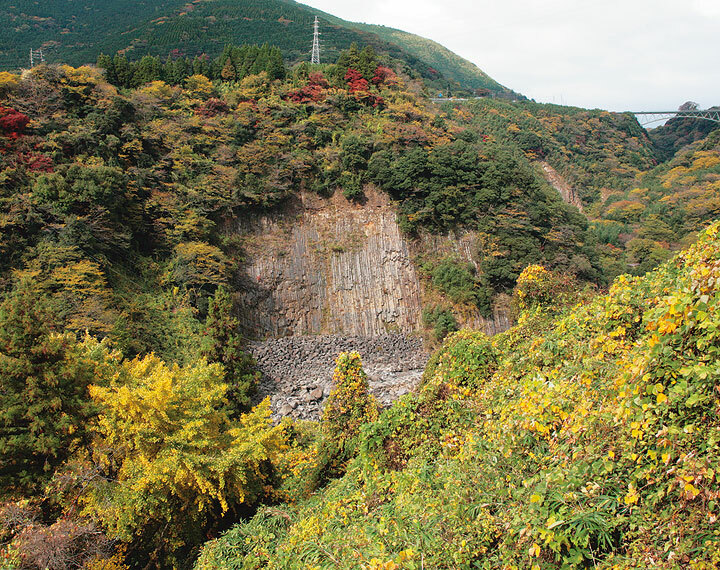 The lava in the valley walls on the north side of Kurokawa River measures as much as 100 m thick. The patterns of the columnar joint vary in the top and bottom sections. A dike at Camel Mountain intrudes into pre-Aso volcanic rocks in the southeastern portion of the caldera (basaltic pyroclastic rock). (In geological terminology a dike is a rock that forms inside, or "intrudes into," a crack in an older rock.) A section running east-to-west and measuring 5 meters thick and several dozen meters long is visible. Visitors can observe the dike's surface and, in the exposed cross-section, the shape of the columnar joints. Based on geomorphological differences, the outer rim can be divided into two zones: the caldera wall on the inner side, and the slopes on the outer side. Throughout the caldera wall, rocks predating Aso Volcano's most recent eruption as well as their covering of pyroclastic deposits are visible. This area features numerous geosites that offer a window into the topography before the formation (collapse) of the caldera, the process and period of caldera formation, and the changes in the topography that took place after its formation. The outer slopes of the caldera rim comprise a gentle plateau that includes undulating landforms, pyroclastic flow plateaus and hills formed from pyroclastic sediments dating for the most part to the caldera's formation. This group of andesite stones stands atop an isolated hill on the outer rim's pyroclastic flow plateau. The tallest is approximately 5 meters high. 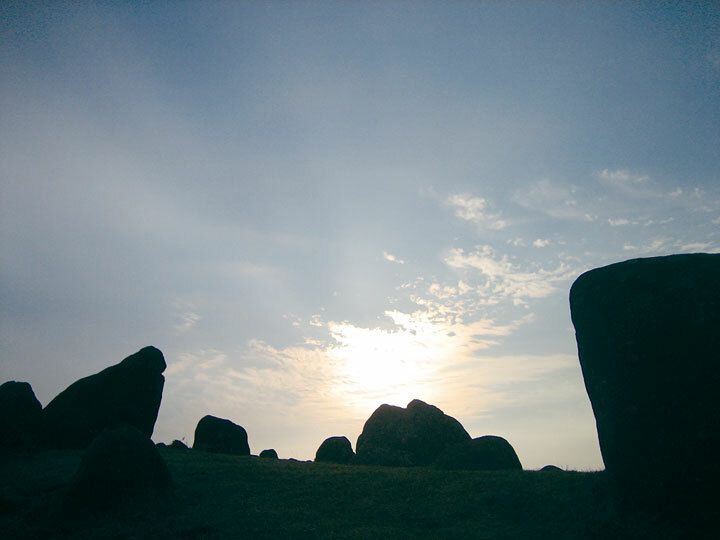 The stones have long been worshiped by local people, and some have argued that they are the remains of an ancient structure. It is also possible they originated as natural dikes. This bedrock creek bottom in the northern part of the caldera is composed of ignimbrite, one of Aso's pyroclastic flow deposits. For a stretch of several hundred meters the completely smooth river bottom is free of all sand and sediment. The depth under normal conditions is about 10 cm, revealing the eutaxitic, or banded, structure of the ignimbrite making up the riverbed and gorge walls. This rhyolite hill rises island-like from the pyroclastic flow plateau. The peak offers not only and excellent view of the plateau but also a more distant panorama of Mt. Aso, Mt. Kuju, and Mt. Sobo. An important lily of the valley habitat is located nearby. Unusual rock formations are found all over this pre-Aso volcanic rock mountain in the southwest of the caldera. The formations along the mountain ridge, the "natural bridge" rocks, and the others are mostly andesite, a type of pyroclastic rock. 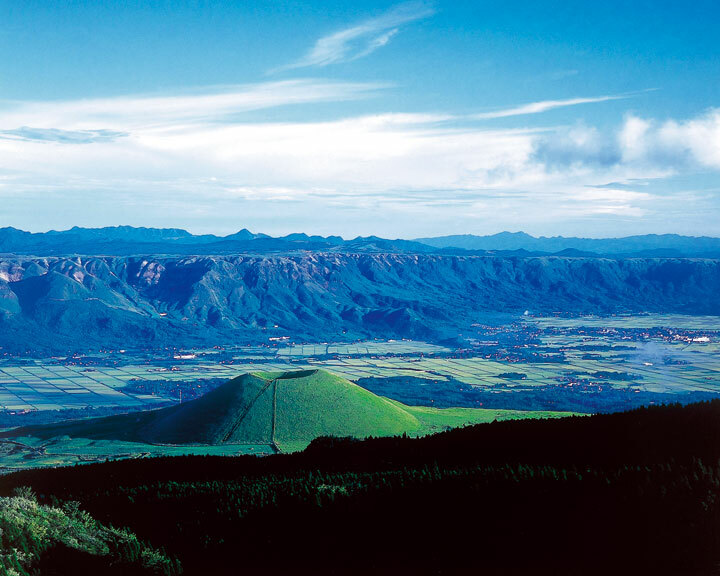 Omine Volcano formed around 90,000 years ago, just before Aso caldera took its present-day shape. 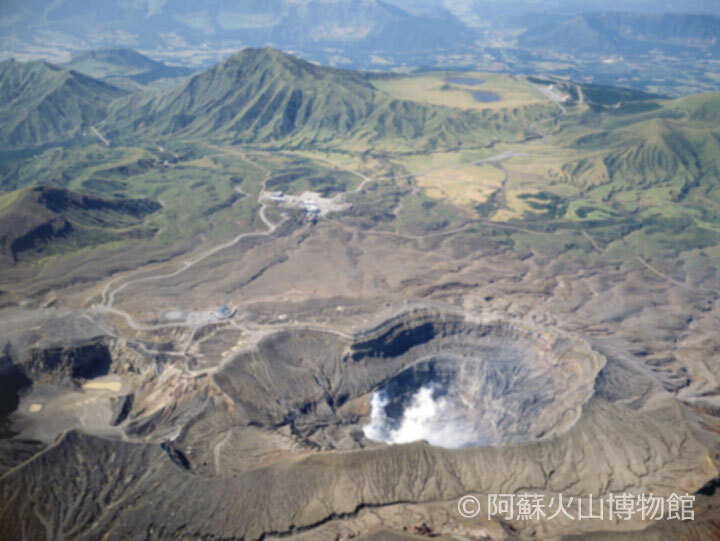 The volcano spilled out massive amounts of lava, forming a vast lava plateau (Takayubaru). 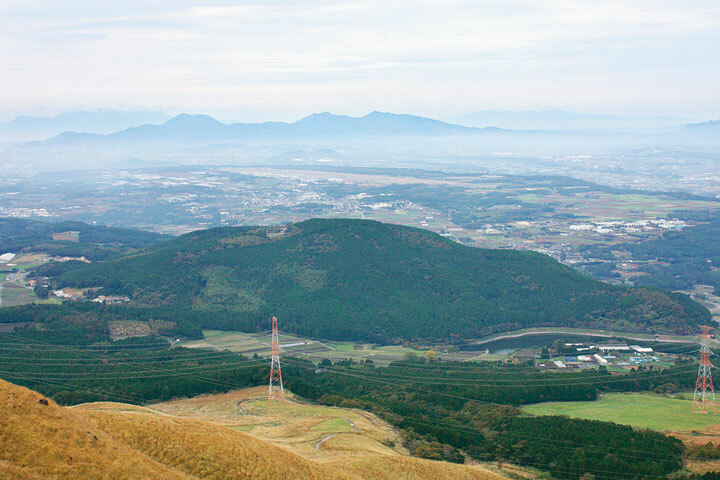 Today the Aso Kumamoto Airport occupies this plateau. This gorge cuts through a plateau 550 meters above sea level that links the southeastern section of the caldera with the outer rim. 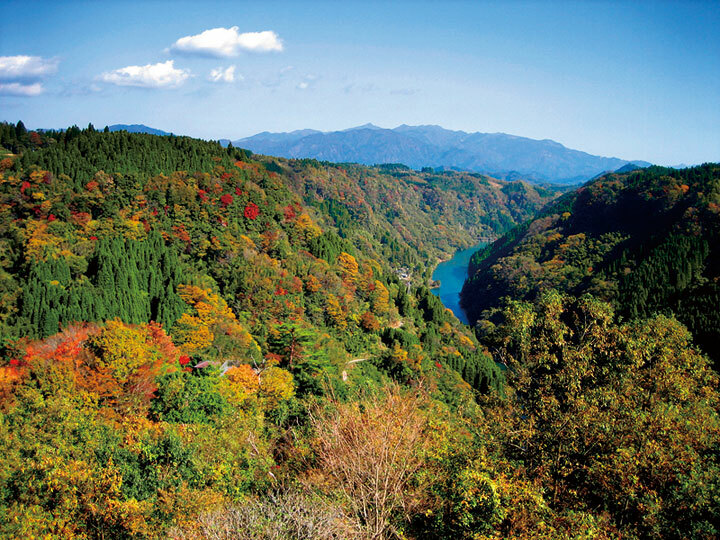 The Gokasegawa River runs along the gorge, which extends for approximately 15 km and measures from 200 to 300 m across. The precipitous walls made of Aso pyroclastic flow deposits (ignimbrite) reach 200 m into the sky.